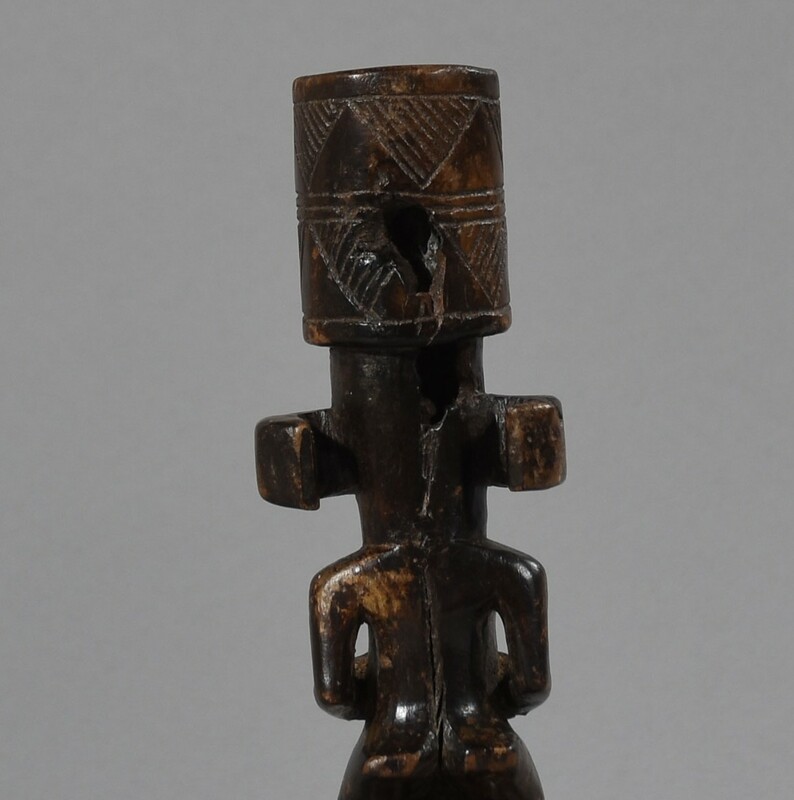 Chokwe Figure with Snuff Mortar, Angola, Democratic Republic of the Congo and Zambia. 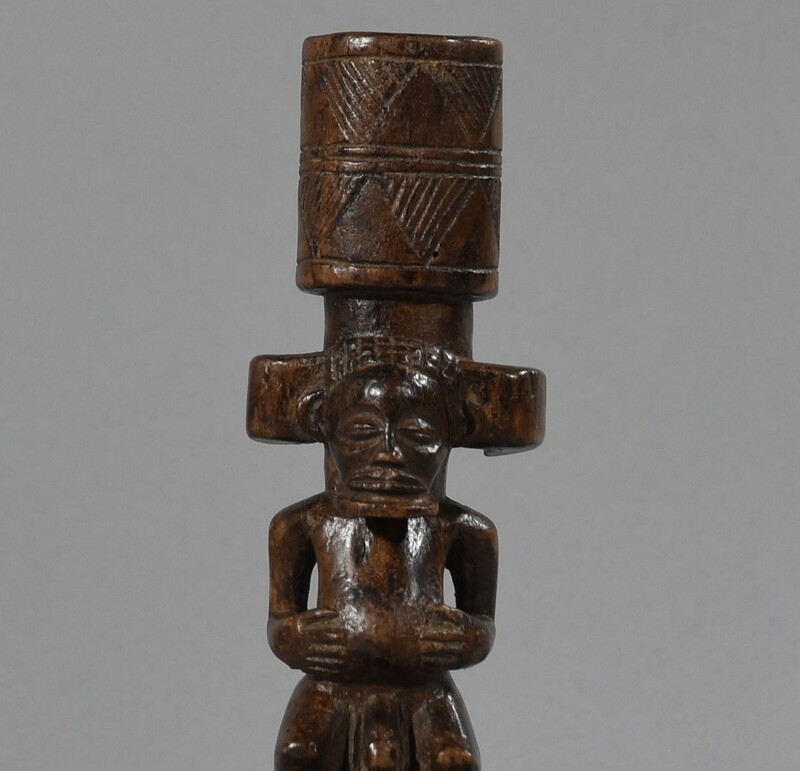 This fine, old anthropomorphic Chokwe male figure with Snuff Mortar (Tesa Ya Ma Kanya) must have belonged to an important person. 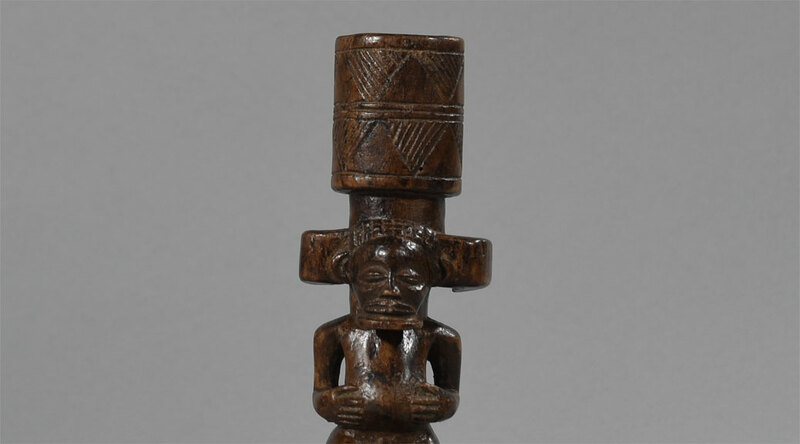 The object was once provided with a tiny wooden pestle attached by a short cord that could be used to grind leaves of tobacco into a fine powder. 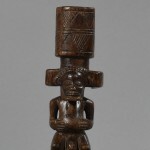 The figure holds all the characteristics of the Chokwe: a stocky body, bent legs, shoulder blades that are drawn back, a wide and powerful neck and a protruding navel. 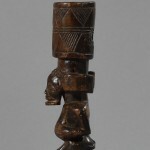 He wears an enormous hairdo (or mutwe wa kaynda), the feet size, and the leg’s open position indicates that he is a person of high princely rank. All demonstrating a great deal of refinements. Chokwe, also spelled Ciokwe, or Cokwe, also called Bajokwe, or Badjok, Bantu-speaking people who inhabit the southern part of Congo (Kinshasa) from the Kwango River to the Lualaba; northeastern Angola; and, since 1920, the northwestern corner of Zambia. They live in woodland savanna intersected with strips of rainforest along the rivers, swamps, and marshlands. They are a mixture of many aboriginal peoples and conquering groups of Lunda origin. The Chokwe language belongs to the Benue-Congo branch of the Niger-Congo languages. 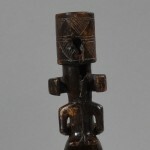 At the end of the 20th century, the Chokwe numbered about 1,300,000. Their history dated back to the 15th century, when a Lunda queen married a Luba Prince Chibinda Ilunga. A significant member of the Lunda aristocracy disapproved of the marriage and therefor they migrated south to present-day Angola. Once settled, they founded several kingdoms, each headed by a god-king. 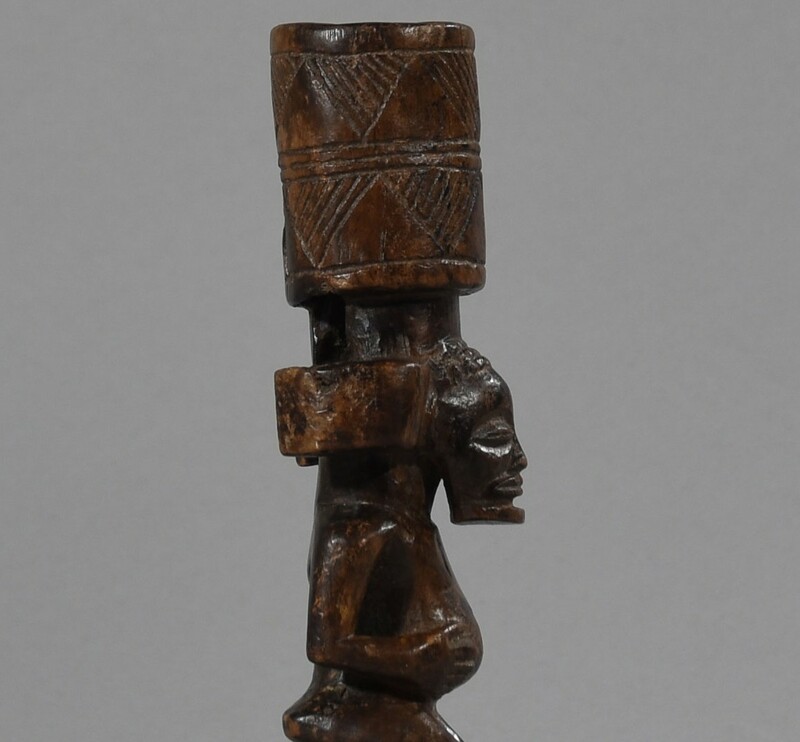 Around 1860, following a major famine, the Chokwe people migrated back and settled in Angola, at the source of the Kwangi, Kasai and Lungwe rivers. The Chokwe are governed by a king called Mwana Ngana, who distributes hunting and cultivation areas. The male Mugonge and female Ukule societies regulate their social life. They are vigorous and courageous hunters and agriculturists, who used formerly to engage in the slave trade. Their dynamic spirit is also reflected in their art. Condition: Dark brown patinated wood with few scrapes and insect damage and signs of frequent use. Literature: Manuel Jordan and Gary N. Van Wyk. 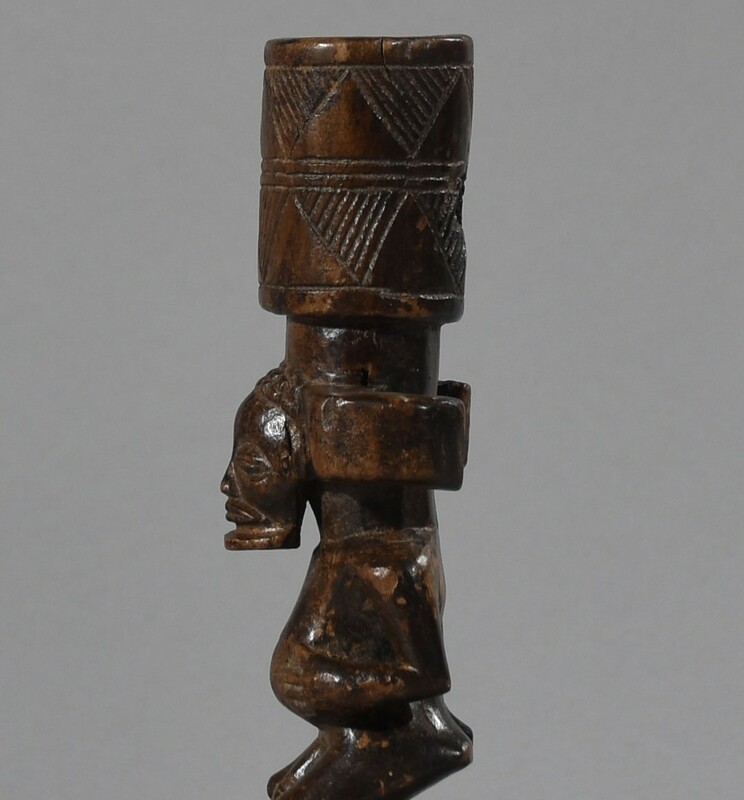 Art and Initiation Among Chokwe and Related Peoples, November, 1998.